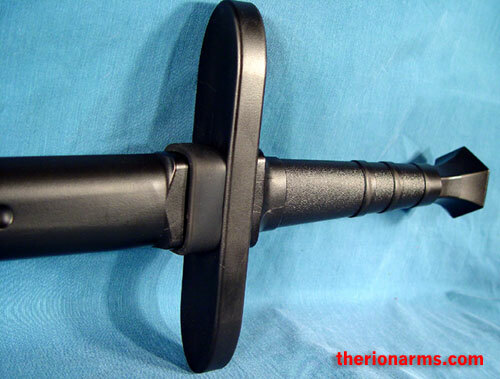 An inexpensive polypropylene training sword. You can beat these swords to death and they'll survive pretty much anything you can throw at them (except for possibly storing them in the trunk in Texas in August - then they'll get a little noodley). The proper name for a training sword, usually wooden, is "waster" (pronounced "waast-er, rather than waist-er), and the name (despite the elitist pronunciation), reflects that training swords are expected to break sometime, i.e., "be wasted". Therefore, the declaration that these particular wasters are indestructible is a complete oxymoron, but here we are. I've been considering calling the whole product line "Unwastable wasters". Listed and pictured here is the longsword version, also available are an arming sword waster and a dagger waster. All training swords, be they synthetic, wooden, aluminum, or blunted steel have their advantages and drawbacks. These particular wasters are great for beginners, folks who really abuse their training weapons, and large classes/demonstrations where instructors need a quantity of identical sword simulators. 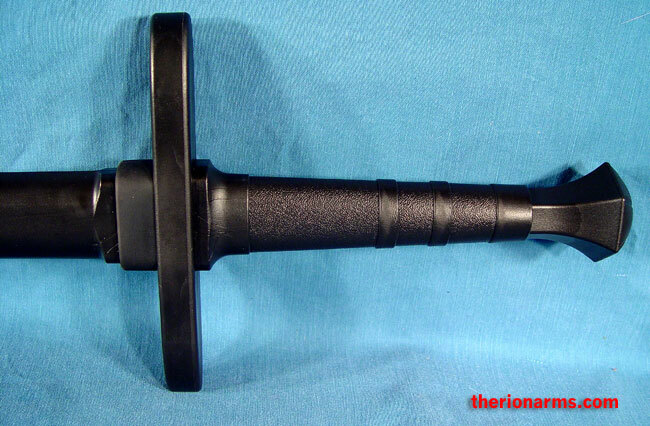 grip and pommel: 9 1/4"
Therion mini-review: I think folks will be happy with these inexpensive longsword simulators. The biggest drawback I see is the balance point - 8" is just a bit too far forwards (cutting swords should balance 4-6" out), but the light weight of this waster helps to nullify that extra few inches of imbalance. 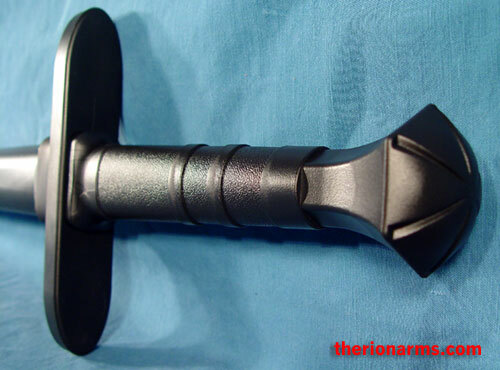 I've seen forum postings where folks have lengthened the hilt by adding in wooden spacers or weighted the pommel by drilling holes and inserting weights. Regardless of the slightly off balance issues, I think you'll like these. The reviewer does talk about the balance problem, but he also points out some other problems with the sword that don't actually exist - he has the guard on upside down. I'm linking the video here so that you can see a "real person" with one of these wasters - note the scenes of him banging one full strength on a park bench with no damage!